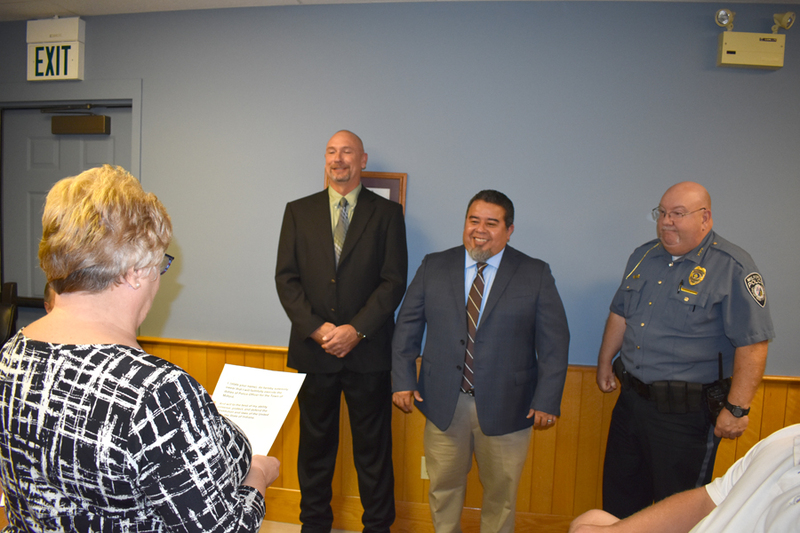 MILFORD — The Monday, Oct. 8, meeting of the Milford Town Council kicked off with the swearing in of two new reserve officers to the Milford Police Department. Scott Anderson and Jon Brito will receive six to eight weeks of training before joining the force in a volunteer capacity. The reserve officers will come in handy, as Town Marshal Travis Marsh informed the council his department has already exceeded the number of total calls in 2017. “It has been a very busy year,” he said, adding it does not appear to be slowing down. Marsh also said the department has benefitted from community participation, which he hopes will continue. Milford police have also been demonstrating camera equipment, “looking at different options,” said Marsh. Unfortunately, the equipment will be “extremely expensive,” as much as $40,000, Marsh reported. School Resource Officer Derek Krieder is currently receiving training. In the meantime, Lt. Tim Miller is the contingency officer in Milford School. During utilities reports, the council approved $84,000 to replace a 2-inch water line more than 50 years old, which has been found to be leaking. The work will run north along East Street from Smith Street to Syracuse Street, where a new hydrant will be installed. Work will continue west on Smith Street to James Street, then south down Williams Street. The redevelopment commission will pick up the cost of the hydrant, $8,000, bringing the total to $76,000. CEDIT funds will be used to help fund the project, which requires a resolution to be signed by the council members. At the September meeting $38,000 was also approved for water line work along East Street from Catherine to Fourth streets. Council member Dan Cochran commented the town should try to complete all of the work before winter, citing the further cost of water line breaks from freezing. “The price will only go up,” Marquart added. In another motion, $5,960 was approved for iron testing on well 3, the largest well in the Milford system. The main Waubee Lake Park parking lot will be closed for the winter, and signs at the boat landing prohibiting parking throughout the summer months will be covered up, enabling winter visitors a place to park. During Town Attorney Jay Rigdon’s report, the council tabled an ordinance allowing potbellied pigs to be kept in town as pets as long as they are spayed, neutered and limited to one per household. The vote was tabled until the ordinance number could be confirmed. Rigdon also found trees are the responsibility of individual owners, except when they are along state roads, such as SR 15, which INDOT has deemed the responsibility of the town. Rigdon’s advice was to trim or remove trees if they are impeding traffic. Rigdon also informed the board any properties owned by Ron Davidhizar that are under a lien could be up for sale next spring. The new owners will be responsible for bringing the properties up to code.